This little book is a treasure chest and worth every cent! What have I hunted through web and space, created docs from saved information, printed out, stapled together and stacked it on my chest – and here it all is condensed and ready to wipe up! Now don’t get me wrong. 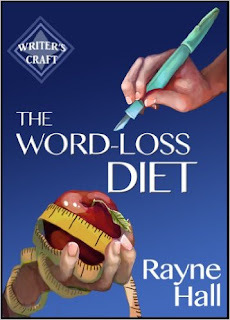 There is fun in the searching and sometimes it is an outright wonderful and legit excuse for procrastination, but when it comes to having it all at your fingertip for future reference Rayne Hall’s little book nails it. What made me smile and my character cringe were her advice on smiling and sighing – we are severely guilty on these charges. As always the advice given is not a rule that has to be followed by all means – in many instances we are offered examples of “slimming in different levels”. It is up to a writer to decide how much fat is needed to convey the essence of the situation or emotion. What works well in one – or for one – may extinguish a voice in another. After all dieting is only healthy if you don’t disappear completely!